My last time trial of the season was scheduled for today but thanks to the all-day rain (actually beginning during the night) the event has been cancelled. After all, driving for an hour in the rain, followed by forty-five minutes of "warming up" in the rain, followed by an hour of maximum exertion in the rain before driving back again probably does not make much sense. Unless you get paid for it.The weather is definitely tending towards Fall since the trees are turning and it was only 3C (37F) when I got up yesterday morning. For some people, riding 40 km/h is clearly not a problem. 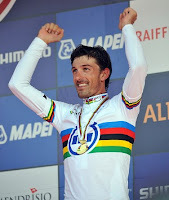 On Thursday, my fave pro bike rider, Fabian "Spartacus" Cancellera, destroyed the field in the World Cycling Championships in Mendrisio, Switzerland, doing three circuits of the 16.6 km course in front of his countrymen in the astonishing (to me) time of 57:55.74, averaging 51.54 km/h over the 49.8 km distance. I checked my math on this twice. For those not metrically inclined, this works out to 32.03 mph. The next rider came in 1:27 later, even after Fabian slowed down in the last 250 m to wave to everyone. It would be marvellous to see him go for the One Hour Record. In today's elite road race he had hoped to get another gold but it was not to be but fifth place is still not a bad effort at all. Now he can spend the winter building up his strength with cheese fondue and chocolate or whatever it is Swiss champions train with. Gosh I don't see why you can't claim to have done 30 km at 40km/h avg speed. I know I would but then I never get on a bike with anyone competitive who could disprove it. Unfortunately, our times are a matter of public record. Alas... Interestingly, in a race you are always faster than out training by yourself anyway. I can't often get my heart rate up to 175 bpm on my own but in a race situation it comes up pretty fast. In my last time trial (the State ITT Championship) I had the picture of Fabian Cancellara in my mind. You know, the picture of the camera from the motorbike behind, catching the snaking powerful movements of each pedal stroke?